Energy is a vital, living moving force that determines much about our health and happiness. Energy Psychology (EP) is a remarkable discovery that blends ancient and modern concepts for health and well-being. 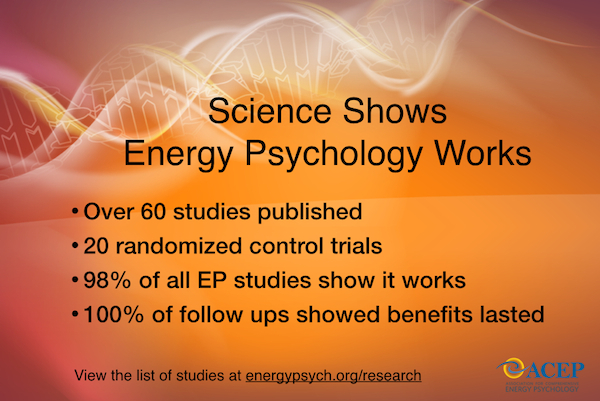 Energy Psychology builds on growing scientific knowledge (and body of scientific evidence) of the human bio-energy system and is a unique approach to easing psychological and physical distress. In Energy Psychology energy is our medicine and it is also the patient. In simple terms, when your energy is balanced and runs clear, your emotional distress can disappear. You are probably aware that chemical imbalances are often involved in psychological issues such as depression or anxiety. There is mounting evidence that the body’s energy systems also participate in emotional disturbances and that energy interventions allow brain chemistry to shift enough to overcome many psychological issues. Energy Psychology (EP) is rapid and effective whilst being gentle and non-invasive. EP can provide an efficient way to deactivate the stress responses associated with disturbing thoughts and memories and pair them with calmer emotional states. We can learn to let go of anger, shame and despair and move towards, comfort, strength and peace. This is a new approach to therapy that dramatically reduces emotional distress and restores harmony by clearing the flow of the body’s electro-magnetic energy system. The energy systems are a major system of the body just as the skeletal, nervous and endrocine systems and have been virtually ignored until recently as a psychological intervention. When disturbed the energy systems start a domino effect throughout the mind-body-spirit. EP combines cognitive interventions e.g. imaginal exposure to traumatic memories (bringing the memory to mind) with interventions (tapping on meridians and/or touch & breath) to rebalance components of the human bio-energy system (meridians, chakras and biofield). It is simple, gentle and very effective with a skilled practitioner. These then bring about rapid, positive change and optimal psychotherapeutic outcomes e.g. extinguish negative emotions (anger, sadness, guilt etc) associated with thoughts or memories or help in the attainment of performance goals. For example, if you were always frightened of public speaking because as a child you were ridiculed for a school performance, we can focus on ‘clearing’ the emotional disturbance of that memory. This then becomes only a story from the past, rather than an upsetting and triggering event that brings up uncomfortable feelings that stop you from being confident to speak in public. These kind of childhood events are common for most of us, and often ‘hidden’ by our unconscious mind in order to keep us safe. Psychological or physical problems can have their beginnings and solutions in the energy systems. It is the subtle energy flow that provide the basic nutrients of the whole mind-body-spirit continuum. We can heal the body by activating its natural healing energies and also by restoring energies that have become weak, disturbed or out of balance. It is also very compatible with other psychological approaches and can compliment traditional medical care. However it can also be a complete and easy system of self care. Use it every day and feel the difference. These techniques also teach you how to work with your own energy and evaluate and balance many of the subtle energy systems within. Within one EP session we can both learn about ourselves and also heal. Our bodies will naturally heal themselves when provided with the right assistance. Sometimes it may be necessary to have an expert to guide the process, but it may not always be essential. It is also important to note that the results will grow and strengthen if you use the techniques between sessions. Similar to working out at the gym – it takes more than one session to build muscles and an expert trainer can help you get the best results in the least time. I use EP techniques every day. They can be self applied when you are boiling the kettle, or waiting for a train!